LEBANON, Ohio – June 23, 2014 – This weekend Doran Racing returns to the site of many of its most thrilling victories — Watkins Glen International —with two potent Nissan 370Zs. The Lebanon, Ohio-based team will be among the favorites in Saturday’s IMSA Continental Tire SportsCar Challenge (CTSCC) race at the prestigious track at the southern tip of New York’s Lake Seneca. Brad Jaeger of Charlottesville, Va. is sixth in the current Grand Sport point standings while his co-driver, B.J. Zacharias of Cincinnati, is seventh with five events down and seven remaining in the 2014 season. 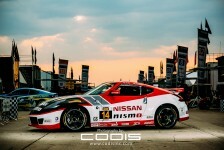 They drive the team’s #14 Nissan NISMO 370Z RC. The #41 Tower Events Nissan 370Z of Toronto drivers John Farano and David Empringham will be on hand and vying for a podium finish on the 3.4-mile, 11-turn road course too. The pair finished third in this race in 2012, just 1.3 seconds behind the winner after 59 laps of competition, enroute to that season’s championship. Anything can happen in a 2-hour-and-30-minute race, but Doran Racing will do its best to be battling for podium finishes at the end of the race. The action gets underway with a 45-minute practice session at 2:20 p.m. Thursday, followed by a similar session at 8 a.m. the next morning. Doran Racing is coming off its best qualifying result of the season, and it will try to better that even more when qualifying for the Grand Sport class begins at 11:25 a.m. Friday. The race itself starts approximately 24 hours later at 11:35 a.m. Saturday. Live video and audio coverage as well as live timing and scoring of the race is planned for imsa.com, while Fox Sports 1 will broadcast its coverage at 10 a.m. EDT on Sunday, July 6. Brad Jaeger: “Doran Racing, B.J. and I all put forth an amazing effort at the last race in Kansas. We didn’t have the result we were looking for because of a penalty, but the focus and determination that everyone showed is something we need to hold on to. If we can bring that to the Glen we will have another great weekend. “Last year at the Glen we had multiple problems that caught us out. We just need to keep our heads down and focus on this year and the races that lie ahead of us. The entire Doran Racing crew has been doing a great job with the pit stops, and B.J. has put forth some amazing drives. Unfortunately my mistake at Kansas cost us a solid finish, and we can’t afford to have another penalty like that. We’ve looked into a few ways to prevent that from happening in the future. B.J. 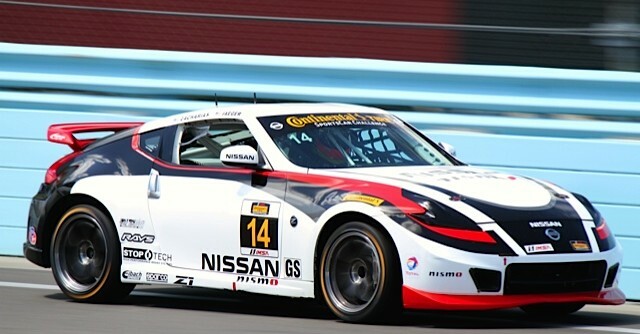 Zacharias: “Watkins Glen has been a good track for the Z and Doran Racing, but we just haven’t been able to get everything firing on all cylinders. Two years ago it looked like the Doran team was cruising for a win and then disaster struck when a ST car drove backwards up the track after spinning and hit Mike Skeen head on. We are still shaking our heads on that one. In all my years of racing in this series I can’t say I had ever seen that one before. “In last year’s race we got caught out between rain and dry conditions. It just did not go our way. “What it is really going to take is green-flag racing. If this happens I believe we are going to have a shot at a solid podium result. “IMSA has looked into some data and helped us a bit after giving other makes performance enhancements. We are now allowed a little wider front tire, which should help make our braking a little more consistent and help us with another gallon of fuel. This will help our refueling window.